Here's the dilemma folks; to buy or not to buy. I really want these shoes. I have them here in my house. I ordered them from the catalogue. Just so that I could look at them. But, if I'm honest with myself, I cannot afford them. I am poor and I cannot afford new lovely gorgeous shoes. Shoes that I really really really really want. If anyone would like to buy this drawing for exactly £75 that would really help me out with this dilemma. I admit it, I'm a shoe whore. Lovely shoe in black ballpoint. That's a very clever way to purchase something you can't afford—draw it and then sell the illustration. I'm going to go right now and draw the Harley I've been wanting and then maybe, just maybe, someone will purchase it for $17,000. It could happen. You think? And I am sure they would look seriously great on you. You are so clever and resourceful Andrea. I want you to meet my daughter as she also has this shoe disease (and purses). My daughter that is the mother of those three girls. How much would that be in US money? I'm not a shoe person but I AM a purse person! I just love your art. I check everyday to see what's new. you kill me (with laughter) i love this illustration, and i'm a dude that doesn't understand the allure of shoes to women. My oldest calls herself a shoe whore also. If i had the cash i'd send it right now, so you could get these. this drawing just pops out and grabs you. Do the shoes come in a mans size 11 (US)? hope you get to keep 'em. Hey Andrea, I'd gift you the shoes if I could! Your middle name must be "genius" because you've come up with one very novel idea!! I hope someone will buy your drawing for double that, because it's worth every penny! Oww, pretty!! What kind of shoe (brand/model) is that? WOWZA! I think this drawing is one of your best! Everything looks so perfect. I wish I could buy your drawing. £75 is nothing to someone who is working and earning though, so I'm sure someone will buy will buy it - I would, if that 'working and earning' person was me! I too, am a shoe whore, and if I had the cash, I'd buy something from you in order to assist you with your lovely addiction. I'm also a Buddhist though, so I know how important it is when we weigh and balance what we need vs. what we want. I wish you luck in obtaining the fantastic shoes you desire. If you're meant to have them, you will. They are gorgeous! Buy buy buy! BTW I don't know what happened with the emails I sent you .. I need your address to send you the bracelet and I sent you my address for the molezines. Sweet! And nicely done! Are those Tracy Neuls?? Ingenious way of generating cash! Great drawing. Hope you sell it and get those shoes! wow, what a fab idea! Wish I could help you out, as love the drawing, but am in same predicament re shoes/cash & need/want balance. 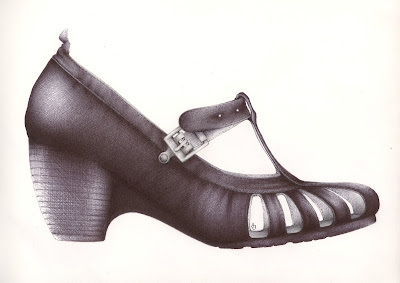 THE DRAWING HAS SOLD AND THE SHOES ARE NOW MINE! I like this drawing very much. I did it on one of those days when you have nothing to do but draw. That feels like such a luxury. As do the shoes. Oh, Andrea!! You lucky duck!! Amazing drawing of amazing shoes! Just wonderful!! Too funny. Before I got to the end I was thinking "she should just sell the drawing" and you did! What an exquisite drawing, the desire is certainly present there. I'm so glad you got the shoes! The genius of selling-the-drawing-to-keep-the-shoes aside (and it is genius), the drawing itself looks like airbrush. I had to click and enlarge it to appreciate all those delicate ballpoint pen marks. Fantastic sketch. Congratulations on being able to keep the shoes, too! Thank you all, folks. I do feel like Penny Crayon! I only thought of the idea as I was posting it. It just came to me, and it was mostly a joke. Because of the success I'm wondering how to do more of this in the future? Anyway, thank you all for your visits and comments. I appreciate each and every one. Cheers my dears. Yes Rick, He bought a motorcycle a Harley I think. I was a young girl when I saw the 60 minute show on him. His name is JSG BOGGS- seems he is mentioned in a scam on Haiti. Yes, the IRS chases him all the time. I was going to suggest. A print Limited print and all of us could assist- Print of course would have had to have a authenticated remarque. Glad those shoes are on your feet. Where is the photo? Oh, did you see Anita Davis' new Shoes? You must go to Her blog and take a peek. Definitely want a photo of those shoes on feet. Forgot to answer this: How much is 75 GBP= $123.00~ approximately USD or 127.00 Canadian dollars or 86 Euros. I hope that gives you a small insight to some of Our true currency as opposed to Art dollars. Oh, what paper did you do the wonderful drawing on?